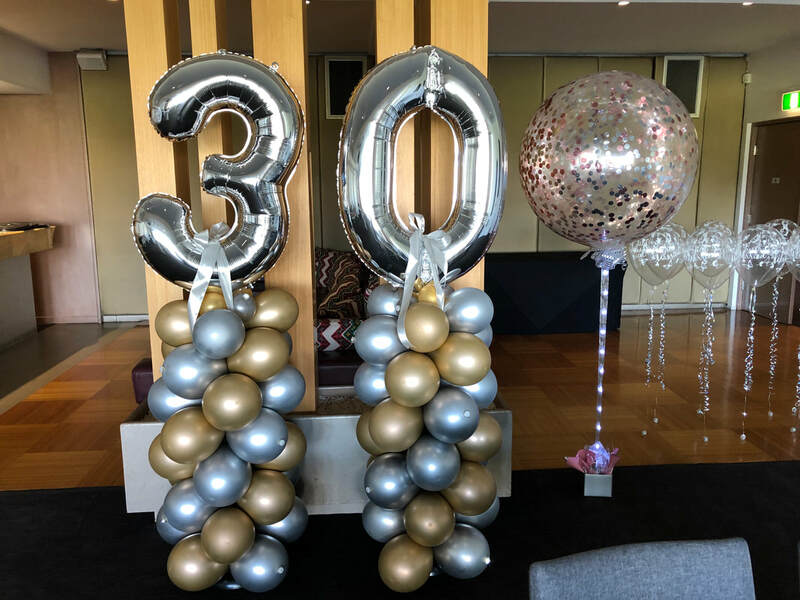 Foil Balloon Numbers & letters - Done the Balloons and Sparkle Way ! 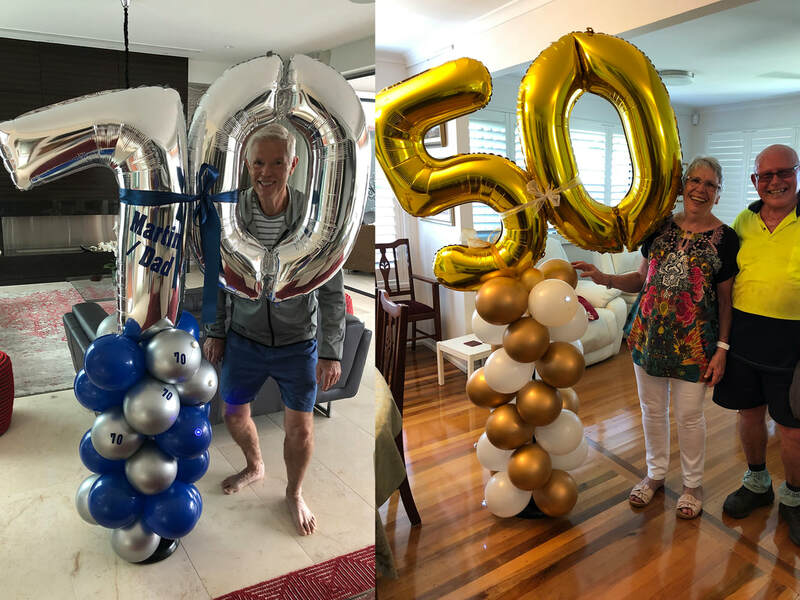 Foil Balloons in numbers and letters are very popular, but we have several creative ways of supplying them. Have them helium filled on weights and choose the simple approach. Have your Name in letters with the occasion and made into a beautiful arch backdrop. 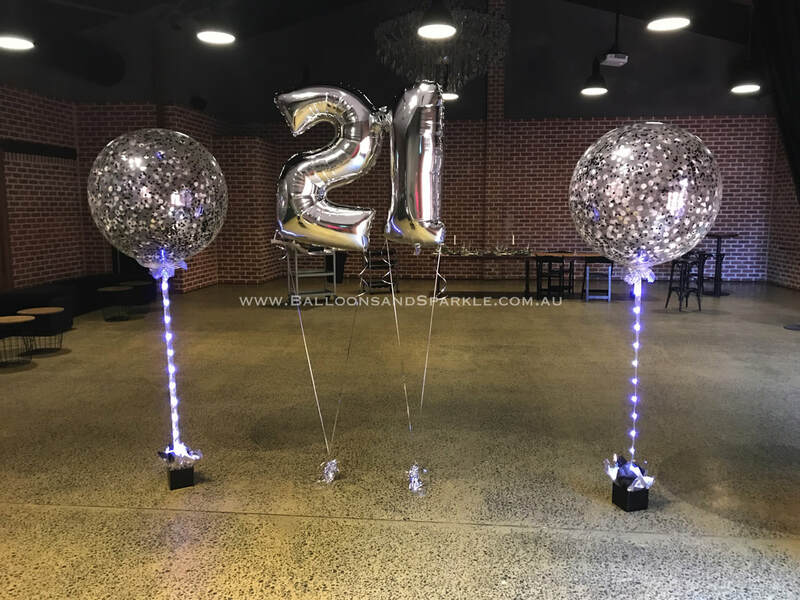 Have the Balloon Numbers placed on top of balloon columns to stand out and stay in place. We add mini L.E.D lights to many of the options below, to bring them to life. We do deliver all over Brisbane and the Gold Coast. Spell out a name - Spell out a message - Spell out Initials with foil balloon letters. Ideal for those special occasions, Corporate Events, Functions, Valentines, Birthdays and more & we deliver them or you can pick them up if you prefer. 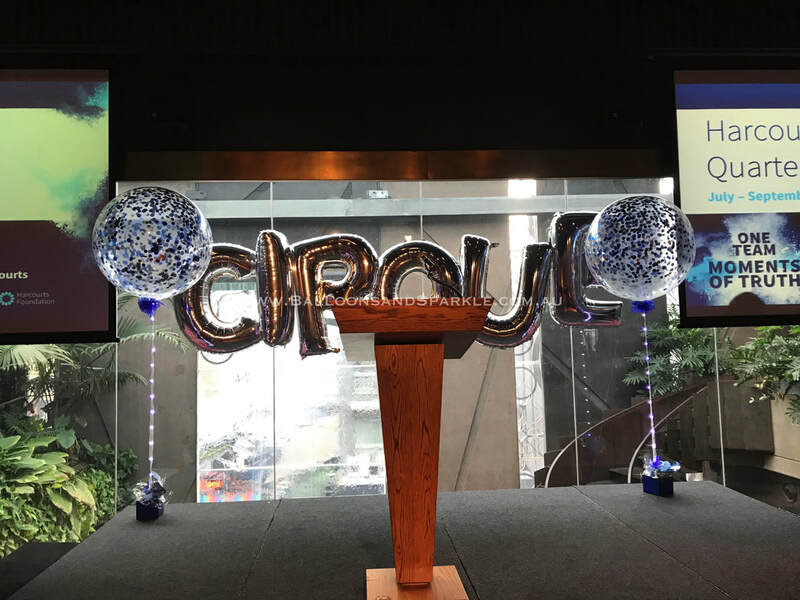 This photo is of helium filled foil balloon letters spelling out CIRQUE for a CIRQUE DE SOLE' Party. Each letter individually weighted $25 each. 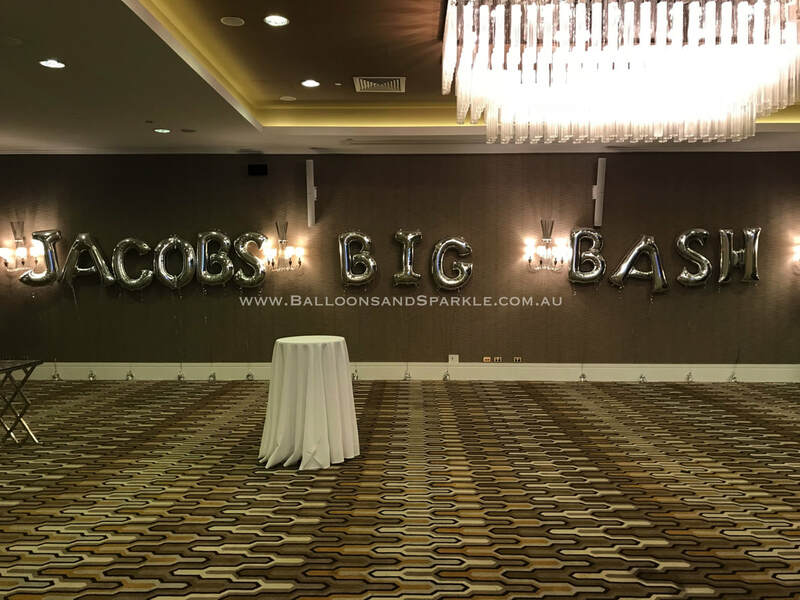 Jacobs big bash spelt out in silver foil balloon letters, each letter individually weighted and helium filled. $25 Each letter. 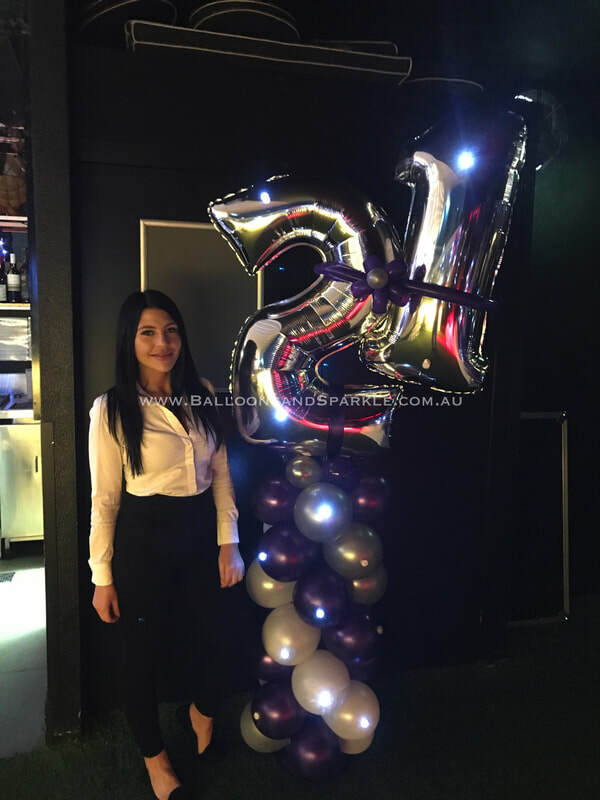 21st birthday party at Factory 51 Coorparoo with stunning Jumbo Sparkle Confetti Balloons either side. $25 per number if ordered with other decor. 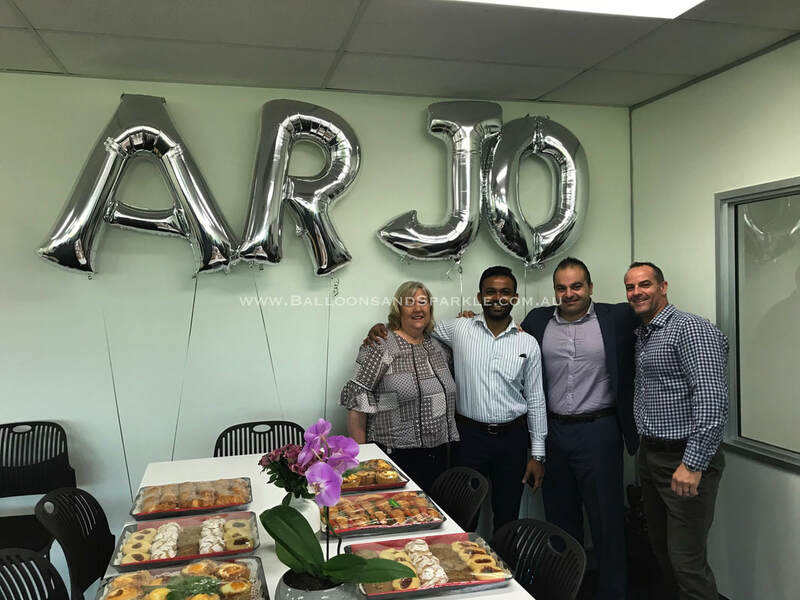 A grand office opening for ARJO. 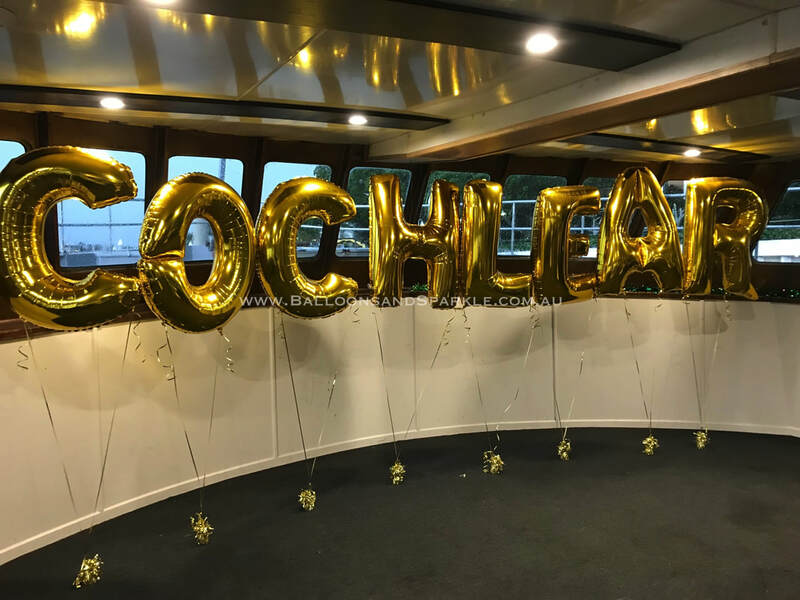 Silver foil helium filled balloon letters did the trick. $25 per letter if ordered with other decor. 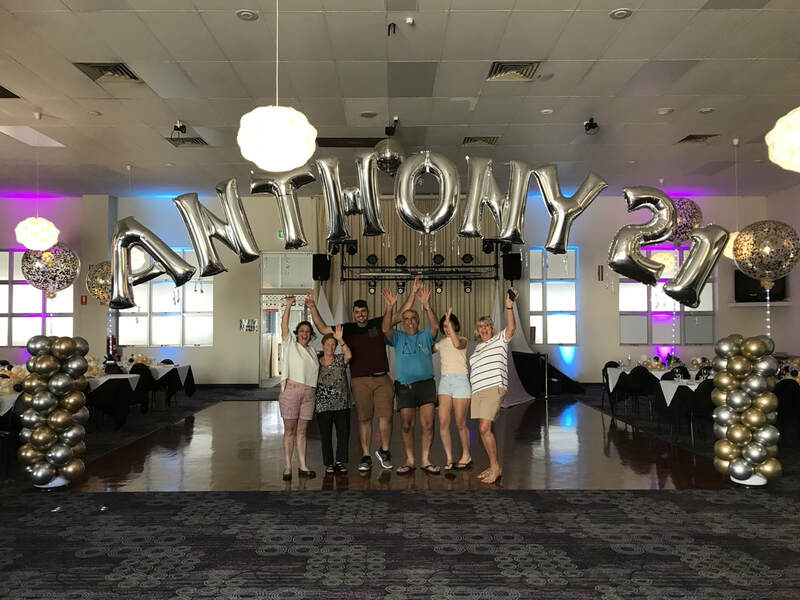 ANTHONY 21 spelt out in Silver foil 86cm balloon letters and numbers with a medium size air filled column on either side in chrome gold and silver. The absolute focal point of the party, PHOTO OP. 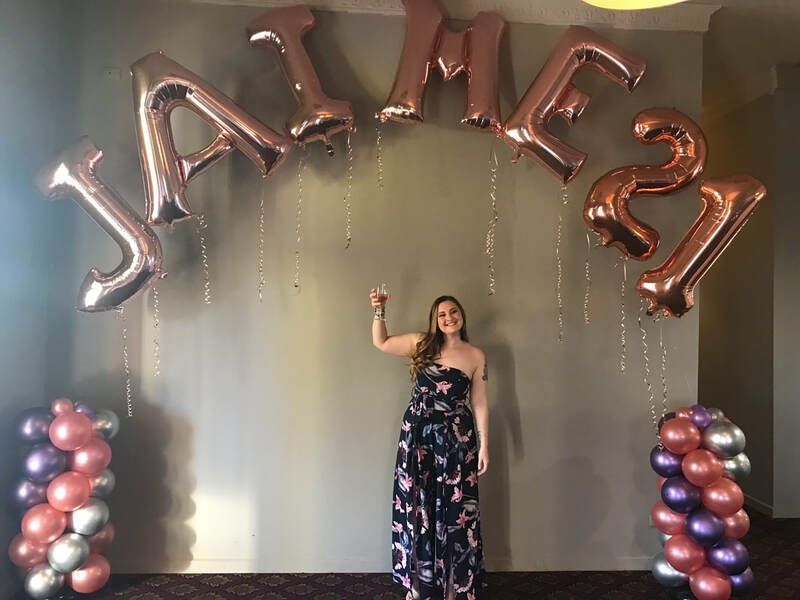 JAIME 21 spelt out in beautiful Rose Gold 86cm jumbo foil balloon letters and numbers with a medium size air filled balloon column on either side in rose gold and chrome silver balloons. 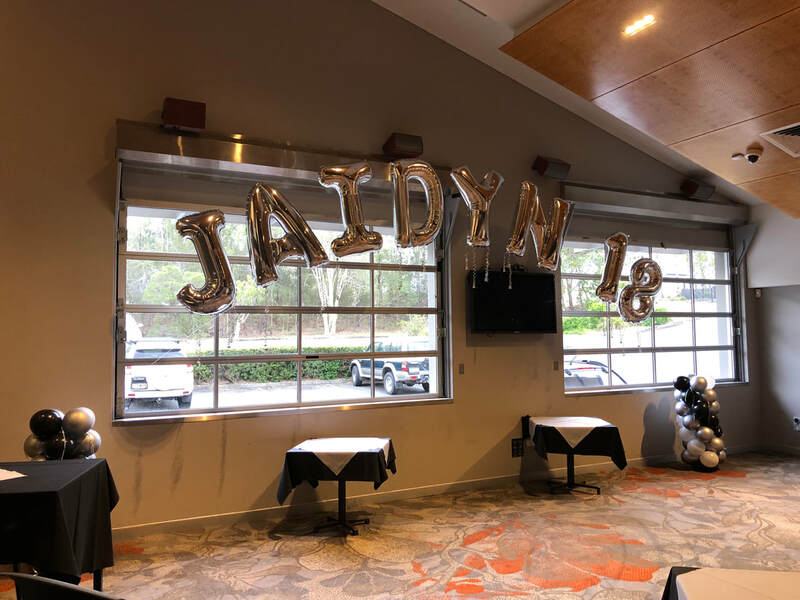 JAIDYN 18 in 86cm jumbo foil balloon letters and numbers with a medium size air filled balloon column on either side in black and gold balloons. A brilliant backdrop for photos and more. 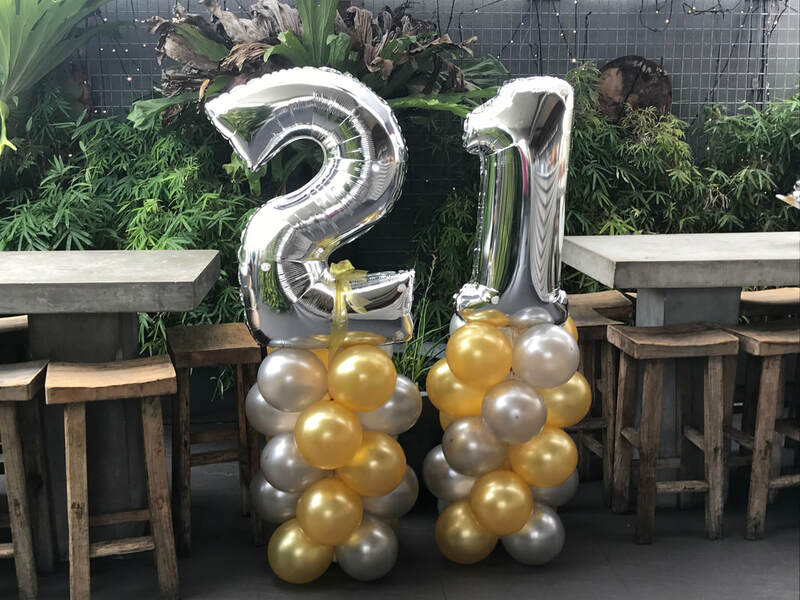 Air filled foil balloon numbers with each number sitting atop a small balloon column, we add mini l.e.d. lights to each number ( party dots ). to bring it to life. These are only $75 each and they are yours to keep. 7-0 in Silver on the left. 5-0 in Gold on the right. Each of these are attached to just one balloon column, so the 2 numbers share the column. We add mini l.e.d lights to bring them to life. 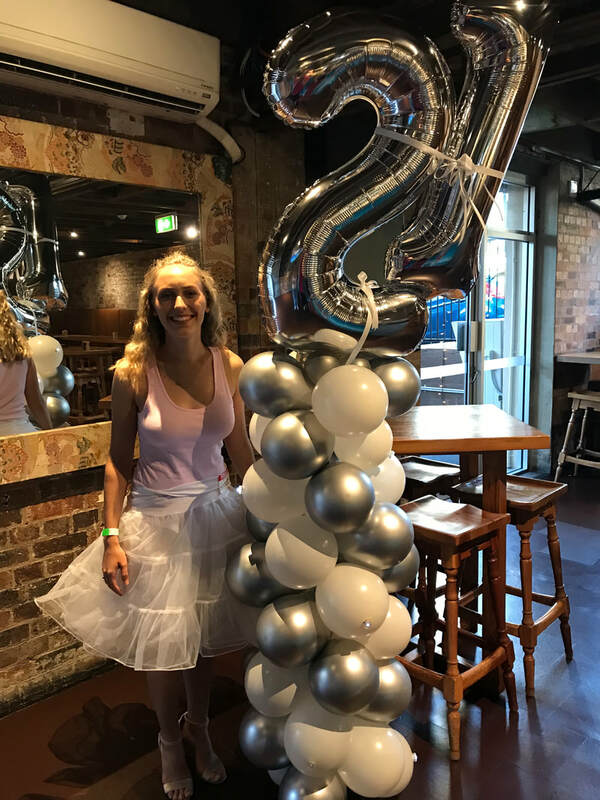 3 -0 in Silver 86cm foil balloon numbers with each number sitting atop a medium size latex balloon column in chrome gold and silver balloons. Mini L.E.D lights are added for effect. 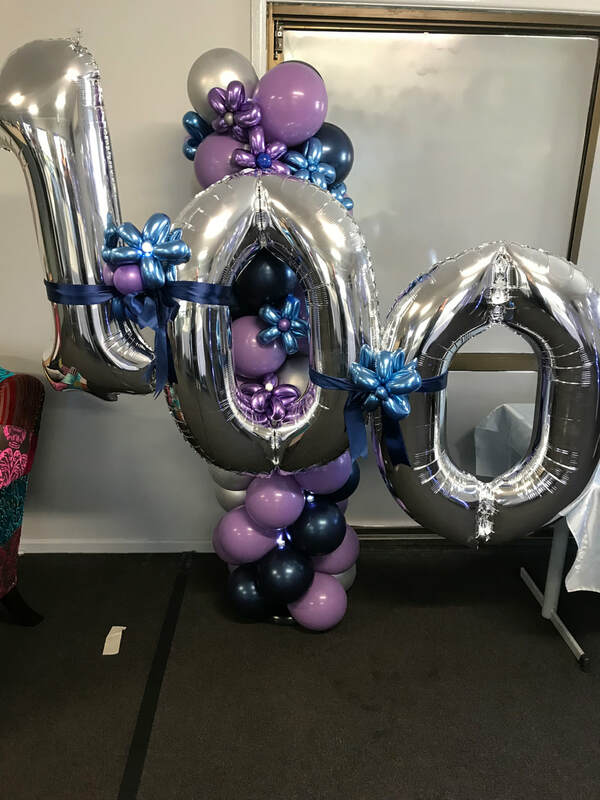 A Very special 100 in silver foil balloon letters, attached to a deluxe balloon column with hand made balloon flowers in stunning chrome balloons attached throughout. We also add mini l.e.d lights ( Party Dots ), to bring it to life ! Another 2-1 Silver Foil with mini l.e.d lights attached in purple and silver theme. This is priced from $125.